NYDN- A dispute over underwear between Derek Jeter and 50 Cent has turned the rapper into a Mets fan. Jeter angered the Queens-born MC after backing out of a deal to promote a line of swanky skivvies because he feared 50 Cent would make the brand too “urban,” according to reports. Jeter is being sued for nearly $5 million in Sweden for reneging on his promise to promote the undie brand Frigo, according to a lawsuit obtained by TMZ.com. “Fifty was totally shocked to hear Jeter felt this way,” a source told the Daily News. The then-Yankees captain signed a three-year deal in 2011 to be a director of the company and agreed to participate in major publicity events, the suit alleges. But the baseball great allegedly got his knickers in a bunch in 2013, telling the owners he didn’t want his relationship with the company made public during its U.S. launch. When Frigo signed 50 Cent as a brand ambassador a year later, Jeter — who is biracial — tried to distance himself even more, fearing Fitty’s involvement would make the undies too “urban,” according to the suit. The undergarments cost up to $100 per pair. Fitty, whose real name is Curtis Jackson, took to Instagram last year to brag about his deal with the upstart company. “I just did a deal for $78 million for underwear. What did you muthaf—as do today?” he wrote. Frigo majority owner Mathias Ingvarsson claims Jeter’s actions have cost the company $30 million and he wants the shortstop to pony up $4.7 million in damages. Representatives for Jeter did not immediately respond to requests for comment. 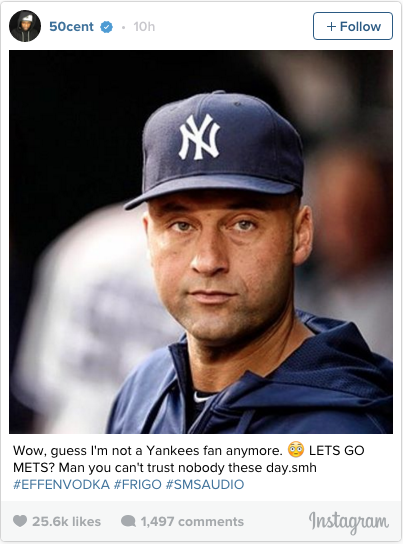 Im siding with Jeter here 100%. Now its kinda been a joke how 50 cent always post #SMSaudio and #EffenVodka after every little thing on the planet. It could be “Thoughts and Prayers for Paris #EffenVodka #SMSaudio” which im pretty sure happened last week. Well the thing is those are 2 very clear companies. When i saw #Frigo at the end of things, I 100% legitimately thought it was to promote a rapper or something. Nothing about Mens Underwear. Nothing but a name that im pretty sure there are at least 10 Puerto Rican’s are using as a current nickname or alias. I don’t know how underwear would get “too urban”, but you cant blame Jeter for thinking that when it sounds like a one hit rapper associated with 50 cent. That’s not to mean that Jeter should back out of this though. It sounded too urban from the jump so i dont get whats stopping him now. Time to embrace your half black and get urban after retirement. This entry was posted in Uncategorized and tagged #EffenVodka, #SMSaudio, 50 cent, derelict, Frigo, Mets, Underwear, Yankees on November 19, 2015 by edlee.